I've spent much of my time the last few weeks knitting stockings. It seems as soon as I finish one and post it on etsy, it sells! And so I start another. I'm so glad that people are loving them as much as I do. 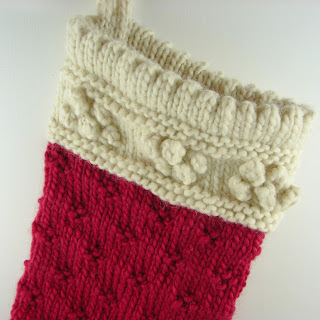 As I mentioned in a previous post this stocking was inspired by a picture for a vintage stocking pattern. 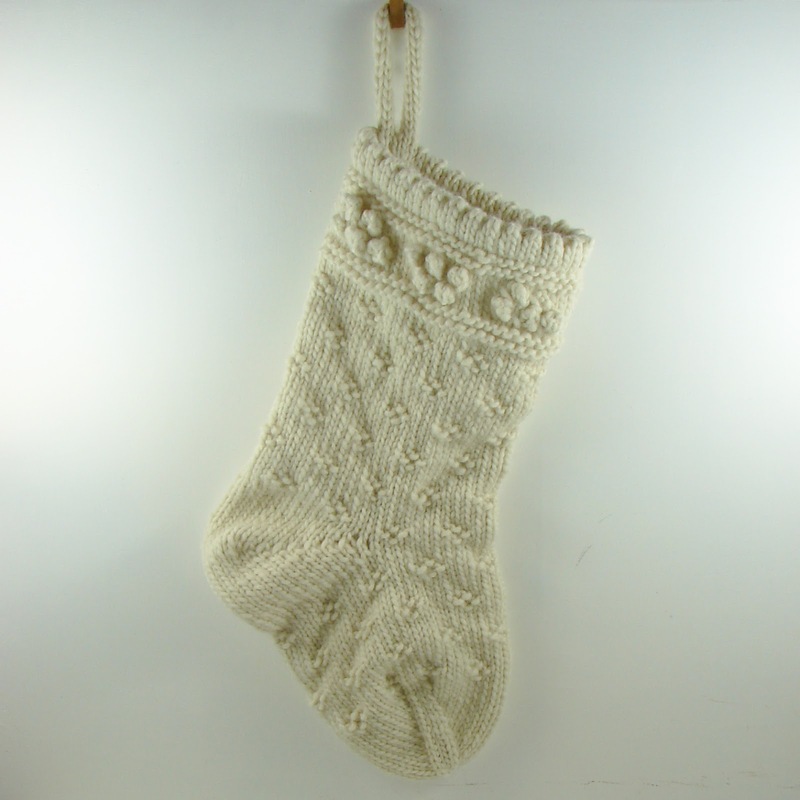 The original stocking was knit in a cream color. It has such a classic, beautiful look to it. I hadn't really thought about trying any other colors until I recently had a request for a version of the stocking in red and cream. I was thrilled to give it a try. 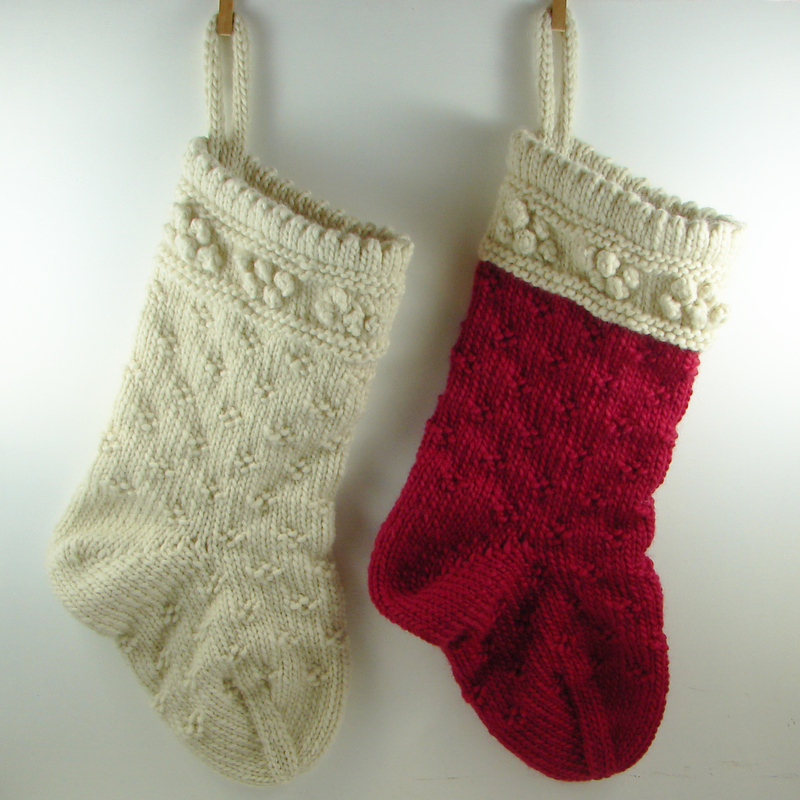 I picked up two different yarns to make the stocking out of. There was a red in the wool roving that I've been using, so I got some of that. The color was not exactly what the customer had described, however, so I picked up a beautiful color of red and some cream in baby alpaca. I sent pictures of both yarns to my customer to see which they liked best, but couldn't wait to get started on the stocking in baby alpaca. The yarn was so soft and it was such a beautiful color. I had nearly finished the stocking by the time I heard back. She ordered the baby alpaca stocking, and I was able to send it to her the next day. It turned out beautifully and I see many more of these in my future! 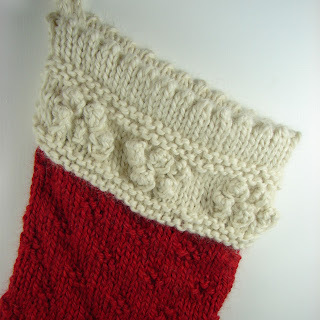 Red and cream stocking in baby alpaca. 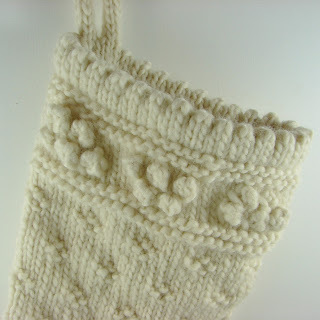 Close up of cuff detail on the baby alpaca stocking. 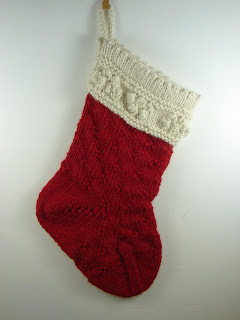 Since I had also bought some wool roving in a cherry red, I went ahead and knit a stocking using it. Although I like the red of the baby alpaca much better, this version also turned out nicely and is now in my etsy shop. Cream and red stocking in wool roving. Close up of wool roving stocking. The all cream stocking hanging next to the cream and red stocking. This holiday season is almost over, but I'm already thinking about next year and what yarn I want to order. I'm considering trying to dye some of the wool roving to get the right color, since it is a bit cheaper than the baby alpaca. I may get some of each. I'd also like to try some shades of green and perhaps some striped stockings with less detail than these ones. I can't wait to get started! 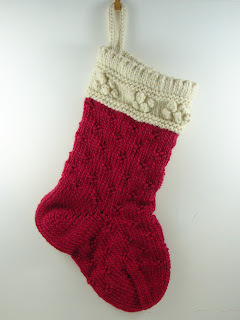 Also before next holiday season I plan to edit and release the pattern for these stockings. I was hoping to do it this year, but I'm quickly running out of time and there are so many other things I need to work on- like finishing making Christmas gifts!